232 pages | 22 B/W Illus. 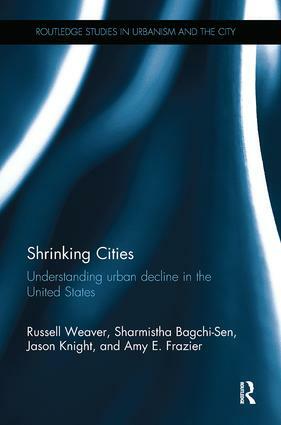 Shrinking Cities: Understanding Shrinkage and Decline in the United States offers a contemporary look at patterns of shrinkage and decline in the United States. The book juxtaposes the complex and numerous processes that contribute to these patterns with broader policy frameworks that have been under consideration to address shrinkage in U.S. cities. A range of methods are employed to answer theoretically-grounded questions about patterns of shrinkage and decline, the relationships between the two, and the empirical associations among shrinkage, decline, and several socio-economic variables. In doing so, the book examines new spaces of shrinkage in the United States. The book also explores pro-growth and decline-centered governance, which has important implications for questions of sustainability and resilience in U.S. cities. Finally, the book draws attention to U.S.-wide demographic shifts and argues for further research on socio-economic pathways of various groups of population, contextualized within population trends at various geographic scales. This timely contribution contends that an understanding of what the city has become, as it faces shrinkage, is essential toward a critical analysis of development both within and beyond city boundaries. The book will appeal to urban and regional studies scholars from a variety of disciplinary backgrounds, as well as practitioners and policymakers. Russell Weaver is an Assistant Professor in the Department of Geography at Texas State University, USA. Sharmistha Bagchi-Sen is a Professor of Geography at the State University of New York at Buffalo, USA. Jason Knight is an Assistant Professor in the Department of Geography and Planning at the State University of New York at Buffalo, USA. Amy E. Frazier is an Assistant Professor of Geography at Oklahoma State University, USA.